Everyone always wants to know about the cats! Over the years Lesley Anne, Evan and family have shared their home with up to 21 much-loved and well cared for cats, but now there is just one resident, Amulet. Amulet, or Mumu as she is known to family and friends, is a beautiful silver-grey Burmilla. Mumu is a bit of a diva, the star of many paintings and TV appearances; she's always ready for her 'close up'. 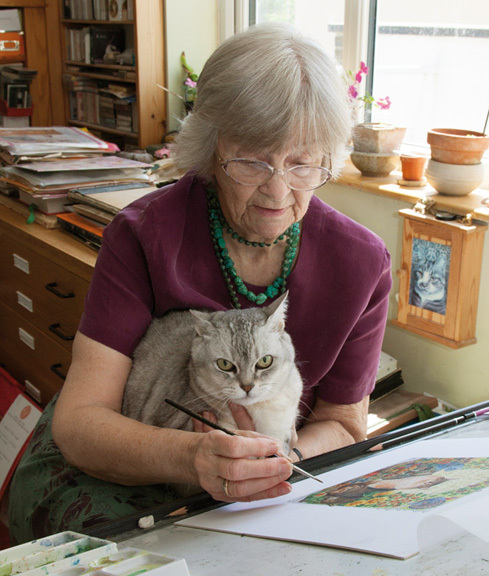 Other inspiration has come from Lesley Anne's many friends with a huge variety of feline stars lining up to feature in one of her beautiful paintings. Every single cat has presented me with new challenges to capture the subtle colours, backgrounds and characters, everyone provides me with new inspiration.